The son of a jailed Wall Street broker turns to crime to pay for his father's release. 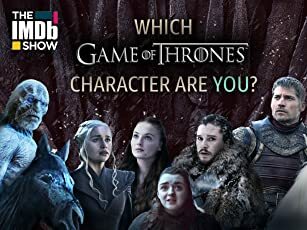 "Game of Thrones" Season 8 has finally premiered, so in celebration we find out which characters fans relate to the most. Although she comes from an aristocratic family, beautiful Prudence Cathaway defies convention by joining the WAAFs and becoming romantically involved with an AWOL soldier. A scientist obsessed with the past transports himself back in time to 18th-century London, where he falls in love with a beautiful young woman. American soldiers stranded in the Philippines, after the Japanese invasion, form guerrilla bands to fight back. Cheated out of his estate by his sadistic uncle, young Benjamin Blake goes to the South Seas to make his fortune so he can return to claim his birthright. Cold War yarn about a US State Department courier who tangles with Soviet agents and seductive women in post WW2 Europe. An American pilot impulsively joins His Majesty's Royal Air Force in Britain in an attempt to impress his ex-girlfriend. This send-up of ragtime song and dance begins in 1915 San Francisco when society boy Roger Grant decides to pursue popular rather than serious music. The O'Leary brothers -- honest Jack and roguish Dion -- become powerful figures, and eventually rivals, in Chicago on the eve of its Great Fire. An unscrupulous agent for the Borgias suffers a change of heart when asked to betray a noble count and his much younger, very beautiful wife. When an heiress finds out that the friendly young man she's met at Sun Valley is really an investigative reporter, she ruins his career by falsely claiming they're married. A singer becomes a star in the Ziegfeld Follies, but her marriage to a con man has a bad effect on her career. Edward Arnold ... Robert Cain Sr.
Lucky Dubarry: I'm leaving town. Robert 'Pop' Cain Sr.: Where to? Lucky Dubarry: As far as 20 bucks and a mink coat will take me. Tyrone Power plays privileged young man Bob Cain, Jr., who adopts the nom de guerre Johnny Apollo when he takes to a life of crime. 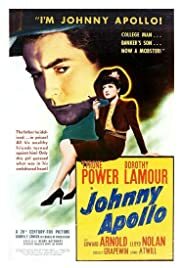 (Incidentally, this movie thus kicks off a string of at least a dozen crime stories of the 40s and 50s named Johnny Something-Or-Other: Eager, O'Clock, Stool Pigeon....) Power chooses crime to spite his father (Edward Arnold) by emulating his dog-eat-dog ethics, for financial tycoon Arnold has been sent to prison for embezzlement, causing a rift between the generations. The plot of Johnny Apollo, a major production, takes a few turns too many but manages to keep a just-passable amount of credibility. Though Power, in the lead, stays less than persuasive as a menacing mobster  he's too much of a pretty-boy, and lacks the acting resources to turn himself into a pretty-boy psychopath  the rest of the cast compensates. Predictably, Arnold is good, as is, in the role of a mob mouthpiece with a weakness for Scotch-and-milk, Charlie Grapewin (whose first film credit falls in the last year of the 19th Century! ); the two seem to be vying for title of America's sweetheart, old-codger division. Best of all is Lamour, with her sad eyes and fetching pout, who leaves an impression here of a skilled actress, more than she managed in all the Hope-Crosby `Road' pictures put together. Direction is by Henry Hathaway, an uneven craftsman who nonetheless rose to the occasion for a handful of movies; this can be counted among his stronger efforts, along with The Dark Corner, Kiss of Death, Fourteen Hours and Niagara. But Johnny Apollo cleaves more closely to the crime melodramas of the previous decade than to the unsentimental and ambiguous style soon to come. But, in it, one can nonetheless sense  particularly in its heavily shaded photography  the birth pangs of film noir, struggling to come into the world. 27 of 33 people found this review helpful. Was this review helpful to you?